Place the breadcrumbs and milk in a large bowl and mix well to combine. Set aside for 5 minutes or until the milk is absorbed. Add the beef and pork mince, eggs, garlic, sage, salt and pepper and mix well to combine. Using wet hands, roll tablespoons of the mixture into balls. Heat 1 tablespoon of the oil in a deep, large frying pan over high heat. Cook the meatballs in batches, turning frequently, for 4–5 minutes or until browned. Remove from the pan and set aside. Reduce the heat to medium, add the remaining oil, onion and garlic to the pan and cook for 5–7 minutes or until lightly golden. Add the tomato paste and balsamic vinegar, stir to combine and cook for 1 minute. Add the stock, tomatoes, thyme, salt and pepper, stir to combine and bring to the boil. Add the meatballs and simmer for 15–20 minutes or until the sauce is reduced and the meatballs are cooked through. While the meatballs are cooking, place the spaghetti in a large saucepan of salted boiling water and cook for 8–10 minutes or until al dente. 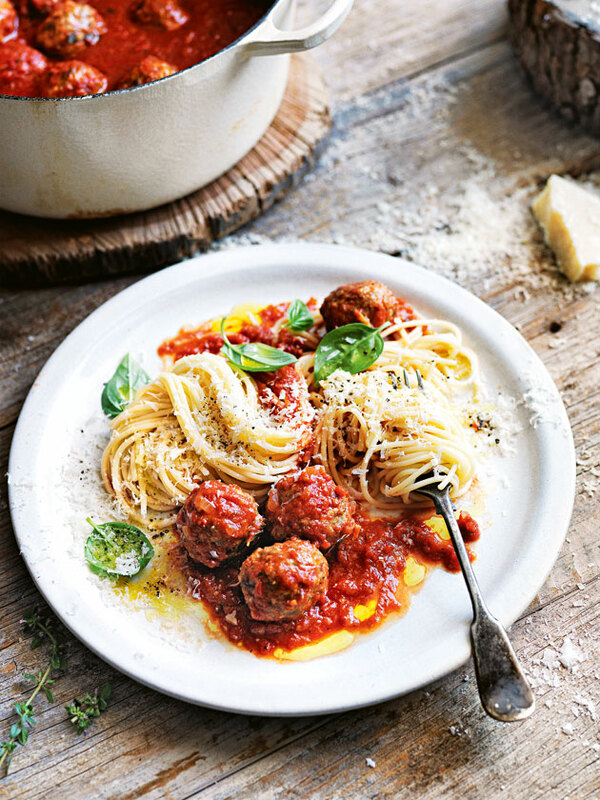 Drain and serve the spaghetti topped with the meatballs, basil leaves and parmesan. Serves 4–6. This recipe will surely become a family favourite.